Here's a winery with ties to Thomas Jefferson and the other founding fathers of the United States. Owned by the Mazzei family, it seems Filippo Mazzei was invited/paid by Jefferson to come over from Italy and plant some of the first European vines in America. These were, of course, at Jefferson's Virginia digs in Monticello. The Mazzei family is still in charge of this estate, located near Castellina in Chianti. The family is a leader in Chianti Classico, being involved in the "Gallo Nero Consorzio," so it is incumbent upon them to produce top-quality wines, especially since so many top producers have dropped out of the "Black Rooster" group. They used to produce a wine called "Concerto," but have recently dropped that label from the portfolio. I think this was a clever attempt at attracting buyers of the expensive wine called "Opus One." The wine may have been noteworthy, but sales were flat. The property comprises something like 79 hectares and they make about half a million bottles of wine annually. They make a range of wines, from a small, little Sangiovese and Merlot blend called "Badiola" to a couple of bottlings of Chianti Classico and a Super Tuscan blend of Merlot and Sangiovese. We have their "regular" bottling of Chianti Classico in the shop. The 2015 is a very good wine, being drinkable now and with the structure to age nicely for another 3-6 years, maybe more. This is about 90% Sangiovese, with small amounts of Malvasia, Colorino and Merlot. It sees a bit of French oak and the wine is nicely elegant and balanced. Siepi is the Super Tuscan blend of Merlot and Sangiovese. The ratio varies from vintage to vintage. The importer does not presently offer this wine. It's usually ridiculously priced, in my view. The Mazzei family owns an estate in the Maremma region of Tuscany and makes wines called Belguardo there. They make Cabernet, a Sangiovese and a blend of Sangiovese and Alicante. Another project is situated in Sicily and the wine is called Zisola. This is a Nero d'Avola red...I found the first vintage we tasted to be a bit over-priced, frankly. The "Conca d'Oro" is, for those who study Chianti, sort of a "grand cru" site. Located in Panzano in Chianti, this is a shell-shaped hillside which is bathed in sunshine. Luca di Napoli is the proprietor, his family having owned the property for a couple of centuries. The vineyards were planted in 1969 and the first Chianti Classico was made in 1975. Consulting with di Napoli is Giacomo Tachis, former head of winemaking operations with Antinori. The "cult wine" made here is called "La Vigna di Alceo," a Cabernet Sauvignon/Petit Verdot blend. It costs a small fortune when you can find it. We have been able to purchase a couple of bottles from time to time, so stop by to see if we have any. "Sammarco" (originally labeled "San Marco") is a Cabernet Sauvignon with about 20% Sangiovese in the style of Antinori's Tignanello or Ruffino's Cabreo. However, for those of us who enjoy Chianti, Castello dei Rampolla's "normale" bottling is worth a look. This used to be entirely Sangiovese and they were proud to say it was lacking Cabernet and Merlot. Today, though, they admit there "may be" some of each of those Bordeaux varieties in their Chianti. It's vinified in cement tanks and then goes into some sort of smallish wood to mature. 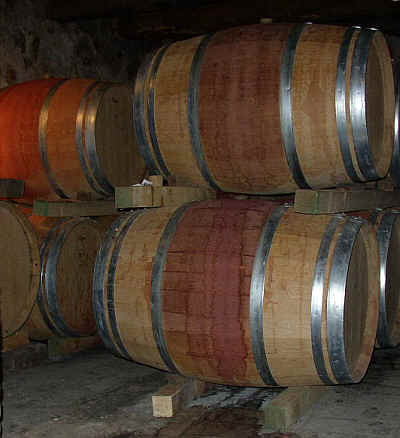 But they don't use the oak for flavoring, simply to allow the wine to develop and mature a bit. This is a legendary wine which put Italy on the world's "Wine Map" back in the 1970s. The property was founded by the Marchese Incisa della Rocchetta whose family acquired the estate called Tenuta San Guido back in the 1940s. Though vineyards existed in this coastal area of Tuscan, not much attention was paid to the wines produced there. Italian wine aficionados were critical of the wines from the Livorno area because they often tasted of the salt sea air (blowing inland off the coast). So the Marchese decided to plant a hectare of Cabernet on a hill which was about a thousand feet above sea level, thinking this would prevent the saltiness. 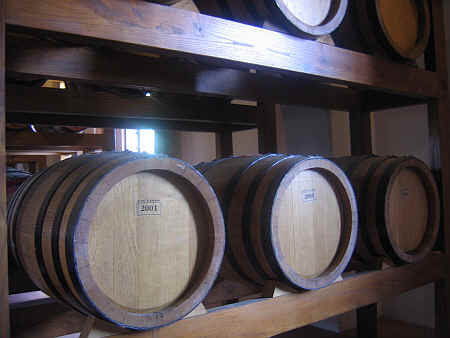 The first wine was made, I suppose, in the late 1940s combining the odd Tuscan tradition of the "governo" process (adding some dried grapes to the already fermenting vat of wine) and the Bordeaux fashion of small oak barrels. Unfortunately, this "innovation" of using barrels was difficult as the barrels leaked! Months after the first wine was vinified, a tasting was held and all in attendance decided the wine was a disaster. Awful. The Marchese continued with other affairs, notably raising horses and flowers. A few years after this sad tasting, he decided to open a bottle of one of the now-aged bottles. 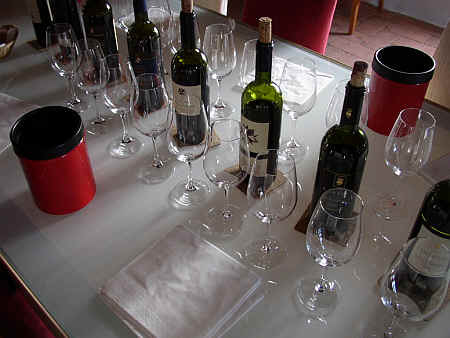 It seems the wines, from various vintages, showed elements of promise. Cabernet, of course, makes a more tannic and astringent, rough-and-tumble red wine. These people were accustomed to easy-drinking, youthfully exuberant Chianti wines which were drinkable just a few months after the harvest. The excessively herbal notes of the Cabernet, which they probably found somewhat crude and rude as the wine was first born, took years to evolve into something more balanced and interesting. Marchese Incisa invited some friends over for a tasting and many were said to have found the wines to offer some potential. Eventually the "governo" technique was eliminated and the Marchese was able to find barrels which were properly coopered and did not leak. Now the Marchese purchased a site at a lower elevation called Sassicaia and he planted more Cabernet (both Sauvignon and Franc, apparently). The wine continued to be good and enough was made to keep the Marchese and his cronies in good supply. A nephew of the Marchese was getting his feet wet in the wine business, the family having been engaged in that trade for hundred of years...his name is Piero Antinori. He tasted his uncle's wine and suggested the wine be made available commercially. The first vintage to hit the market was the 1968. I recall being aware of Sassicaia starting with the 1973 vintage. The wine was, for me, mind-boggling! There was a small importer named Jerold Jacoby who had some curious French and Italian wines and Sassicaia was amongst his various offerings. He had a legendary salesman named Bill Cooke working for him. Bill was an enthusiastic fellow, to say the least, and a major "character" in the Bay Area wine business. On my first foray to Italy we had an appointment with the Antinori winery. The English-speaking woman who showed us around that day (I think she was American) took us to Antinori's main winery. We inquired about Sassicaia (since Antinori would bottle the wine for his Uncle). She explained that no Americans were allowed on the estate since the visit of some guy from San Francisco who was speaking an odd combination of Sp-Italian or Ital-ish. (Bill hailed from Argentina, so his Italian was laced with Spanish!) We were disappointed, of course. Knowing Bill Cooke, though, well, anything is/was possible. Over the years Sassicaia has gained in fame and prestige (and price!). It carried "cult" status (long before Araujo, Harlan, Dalla Valle, Bryant Family and Screaming Eagle from California's Napa Valley). On a visit one year to Milano, the lovely and most attractive Barbara Ferri wanted to treat me (and the rest of Le Crazy Milanese) to a bottle of Sassicaia. She scoured Milano and finally begged a restaurateur for a bottle. "Only because you and your business associates dine here frequently will I consider parting with a bottle!" he offered. The wine is still much sought-after, though its lofty price now keeps the "riff-raff" from being interested in buying some. Italy's great, fancy restaurants all have Sassicaia on their wine lists. It's a badge of honor and an indication to patrons that the sommelier knows what he (or, perhaps she) knows wine. A fair bit of Sassicaia reaches the export market. The American market has long been important. We received some bottles nearly every vintage. Sadly, though, in prime vintages those who buy wine only when The Critics proclaim success, get involved and Sassicaia achieves amazing prices. The 1997 vintage is an example. Arriving here through its normal channels, the wine costs $150 a bottle. However, we received offers from gray market importers who had prices twice that!!! Yet there are few vintages of Sassicaia which do not merit the adjective "excellent." The wine has become so hard to get that others outside of the Marchese Incisa della Rocchetta family have started to "make" Sassicaia! The Italian "fraud squad" recently seized something like 16,000 bottles of fake Sassicaia in Naples. The counterfeiters had sold the wine in various locales in Italy, claiming the attractive price was because an overseas importer did not take its allocation of Sassicaia! While news reports claim none of the bogus wine was exported, this cannot be guaranteed! Today Nicola Incisa della Rocchetta runs the property. He now has many neighbors! I visited the region of Bolgheri a few times. The region is amazingly similar to the coastline from Half Moon Bay to Santa Cruz! Bolgheri seems to be a prosperous little village, though aside from a restaurant or two and a gelateria, I'm uncertain of what commerce goes on. Numerous new estates have been 'planted' in the neighborhood. Piemonte's Angelo Gaja has a wonderful winery near Sassicaia. The Tenuta Ornellaia is down the road, too. Antinori makes a wonderful wine from grapes in the same neighborhood and their wine is, frequently at the top for the Bolgheri region. So, Sassicaia is, no longer, the only game in town, but it still is the "leader" in being an ambassador for wines from Bolgheri. The wine is typically 85% Cabernet Sauvignon and 15% Cabernet Franc. Yields in the vineyard are restricted to intensify the character of the fruit. Two years aging in French oak contributes a bit of wood to the fruit of Sassicaia. While, at one time, Sassicaia was an extraordinary wine from Italy, I can only say recent vintages have been less exciting than the wines I recall tasting some years ago. A new wine called Guidalberto is being introduced. I bought a bottle in Italy and tasted it with some friends. I was not especially thrilled, frankly. I recently had a taste over here and my initial impression was confirmed. I overheard someone from the estate telling an associate at a trade tasting (in Italian) "Don't tell people this is a 'second' wine. It's not a 'second' wine!" Though I understood what he was saying, I could only think "He's right...it's a third or fourth level of quality." We have seen a decline in the quality of the wines being made these days. The estate has been enlarged and today they cultivate about 90 hectares and are making close to a million bottles! It's not the same as it was. Some years ago we were surprised to see they offered a 2002 bottling of Sassicaia. This was a very difficult vintage and the wine was really weak, a good example of wine from a poor vintage. Still, the wine cost a lot of money and it seemed to us to mark the start of an era where Sassicaia was merely a label of a luxury product like Rolex or a purse with a designer label on it. They, in our view, betrayed the consumer by merely selling packaging and not making a top quality wine. It still received a "Tre Bicchiere" award from Italy's Gambero Rosso wine guide. That, too, was a disappointment, for it signaled that the people on whom many consumers rely on to provide valuable assistance in highlighting top wines, were not paying attention to the contents of the bottle. A fellow from the winery had stopped by a few years later and we suggested they should not have bottled a wine of such lackluster quality. He defended the wine saying it was a difficult and challenging vintage. Yes...Sure. We understand that, but the wine still carried a premium price and was a weak example of Sassicaia. They could have, in our view, declassified the wine and sold it under the Guidalberto label. He could see only the perspective of the winery and had, seemingly, little sympathy for the consumer who was being fleeced. The 2003 vintage, an exceedingly hot year, produced another rather ordinary red wine. A winery rep told us this vintage was being compared to the legendary 1985 vintage! We could mention the 2007, which was certainly better than 2002 and 2003, but it wasn't, in our view, a truly great wine. And now, as we write this, we've tasted more recent vintages which continue to get accolades from various wine publications. At a tasting in Europe we asked a friend who's a wine aficionado to please come taste the new vintage of Sassicaia. We both found the wine to be perfectly well-made but rather simple. "Well, you know these wine guides have to sell copies of their magazines and books." she told us. The following year we met again and tasted the new release and both of us found a wine of the quality of a rather modest Chianti Classico, not a noble Cabernet blend. "Yes, it's a pity." she said. The 2015 is another wine that has been reviewed with near perfect scores. We tasted it in 2018 and were disappointed. We poured tastes for our colleagues here at the shop and the wine sat in the glass for maybe 15 minutes, or so, before they arrived and could taste it. We did not tell them the identity of the wine, wanting to hear their honest critique of the wine, tasted "blind." Ellen found the wine to be made made from very ripe fruit and found it to be a bit jammy. Our other colleagues were also unimpressed and were not interested in recommending this wine. We revealed the identity of the "mystery red" and nobody was impressed. And yet the various American critical publications all urge readers to invest in this wine, seemingly competing to see who can lavish the most praise on it. We suspect all those people who write about wine were tasting the 2015 knowing full well what they were tasting. Perhaps they might consider making their evaluations of wine "blind" so as to not be influenced by the reputation of the winery or the price tag on a bottle. At a tasting for the trade in early 2019 the 2015 Sassicaia was offered and we finally tasted a good bottle. So now we might ask why are these bottles so inconsistent? How many bottlings do they have? Currently in stock: Sold Out. Literally and Figuratively. 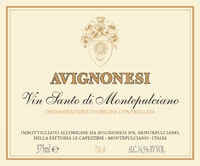 For a few years, many experts had Avignonesi at the top of the list for Vino Nobile wines in the town of Montepulciano. They did make some extraordinary wines in the 1980s and, since then, have a few high-priced bottlings which may rob the basic wine from being consistently good. Many vintners get side-tracked into making special bottlings of rare and costly wines and to do this, sometimes they use fruit which was perhaps the 'foundation' of the normal bottling. The wines today seem to be a bit more approachable in their youth and they're a tad lighter, too. When we first got to know the wines, a young fellow named Marco de Grazia was representing the property. He's not been affiliated for many years and he's now going by the name "Marc." My how things change! Owned by the Falvo family for many years, they sold the property to a Belgian woman, Virginie Saverys. She retired from practicing law and has jumped in to the Avignonesi production with both feet. There are about 200 hectares of vineyards scattered around Montepulciano and nearby Cortona. There are 8 parcels in Montepulciano, while in Cortona they have 7 plots and cultivate Cabernet, Merlot and Chardonnay for the most part. Ms. Saverys is a proponent of organic and biodynamic farming. An agency which audits vineyards for organic certification requires three years of monitoring at the outset and Avignonesi was slated for certification in 2016. 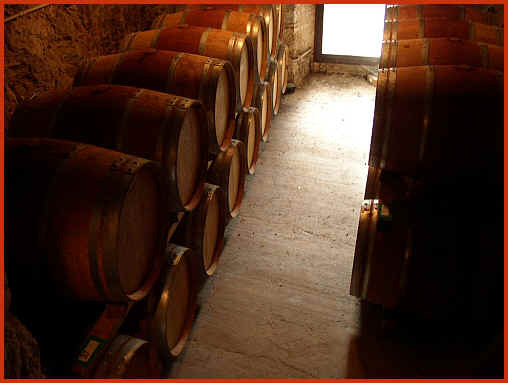 These little barrels contain the precious Vin Santo. One wine that's caught our attention a few times is an amazingly concentrated Vino Nobile from the 1999 vintage. It's called "Grandi Annate," "great vintages." They don't make this very often: 1990, 1993, 1997 and the new wine from 1999. The 2003 is nice, but I am not certain it's truly a "grand" vintage. I bought a bottle and we found the wine perfectly fine, but not as compelling as its predecessor. 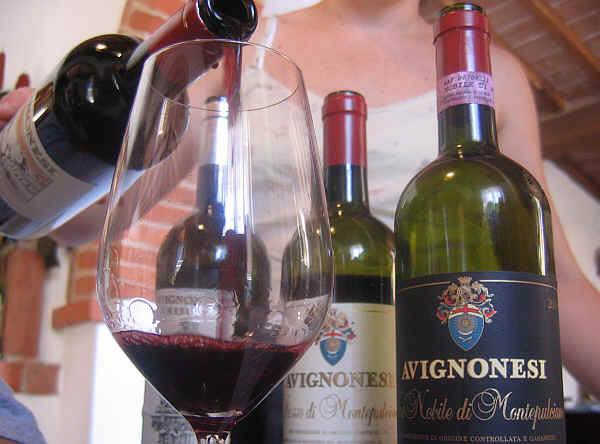 The current vintage of Vino Nobile is 2013...perfectly well-made wine. It's along the lines of a good quality Sangiovese from other parts of Tuscany. That's a polite way of saying it's perfectly nice, but to our tastes, not as "nobile" as we would like. Vin Santo is a particular "show piece" at Avignonesi. They make two different bottlings and each is matured for about a decade in small wood. The 'regular' bottling is made from Grechetto, Malvasia and Trebbiano, while the Occhio di Pernice is made of Prugnolo Gentile. Both are hugely sweet and impressive wines. These are not for simply dipping biscotti. They are grand expressions of Vin Santo and will impress those who drink nothing but Chateau d'Yquem. The Brancaia estate is located in Poppi, a small village near Radda in Chianti. It's owned by a Swiss couple, Brigette and Bruno Widmer. They bought the place in the early 1980s and the first wines were made by their friends at Castello di Fonterutoli. Now they have their own winemaking facility and since the 1998 vintage, the wines are made under their own roof. Their daughter Barbara holds the title of winemaker, assisted by consultant Carlo Ferrini. 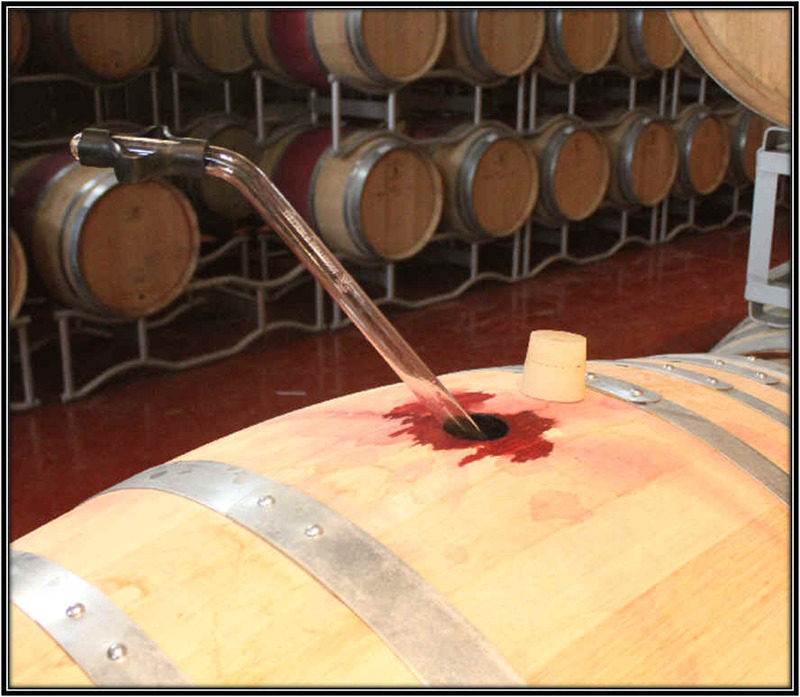 Signor Ferrini has a bunch of famous wineries in his stable, including Brolio, Riecine, La Massa, Fonterutoli, Tenuta di Terriccio, Poliziano and Casanova di Neri, so it's not surprising his fingerprints are visible on the Brancaia wine. There are about 20 hectares comprising the estate, 10 in Castellina and 10 in Radda. Chianti Classico and the IGT wine "Brancaia" are the wines produced at this estate, though I understand the Widmers have purchased some land on the Tuscan coast near the famous estates that produce Sassicaia, Ornellaia and Sassigaja (that's my name for Angelo Gaja's Bolgheri project). They made some very good, showy wines. These had been matured in a bit of new wood and routinely were mildly cedary and woodsy. They got our attention, for sure and they had a bit of cache in the market. The winery is well off the beaten path, being in the Localit� Poppi, not too far from Radda in Chianti. They do accept visitors, but apparently ask guests to pay something like ten Euros for a tour and tasting. It seems Napa has arrived in Tuscany! We sent the winery a note suggesting they consider putting a wine glass in the hands of their trade partners who pay them a visit. The fellow who had married* into the family was horrified to learn of our visit and the rather shabby treatment. 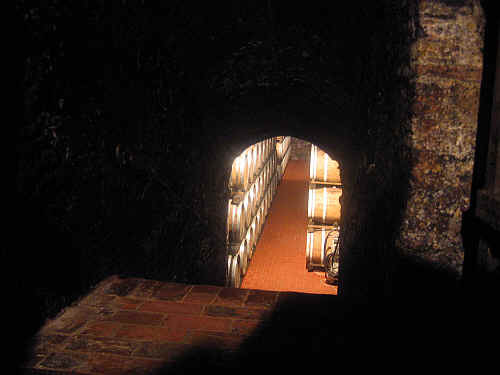 We had been shown around the modest cellar, make the rounds down one side and up the other, returning to the entrance. At that point we were thanked for our visit and the door was opened so we could return to the car. *The couple was divorced a few years after our visit. Hopefully we were not the cause of marital tensions!! Brancaia offers a more modestly priced wine called "Tre." A book came out in Italy (published in April of 2010 and written by Andrea Scanzi) which quotes a Tuscan vintner who cites a government investigation of some shady practices which are said to be commonplace in Tuscany. The folks at Brancaia were "outted," a vintner claiming Brancaia's wine had been impounded. In responding, the Widmers assert that for their top wines, all the fruit is from their own vineyards. "Our easy-drinking wine, Brancaia TRE (IGT), is made from grapes that we have not selected for our top wines. Because of the success of and demand for Brancaia TRE, in addition to the grapes we grow ourselves, we have been buying grapes and bulk wine � both Toscana IGT � for some time now. This is no secret and it is by no means a crime." This statement, posted above in blue, was made in response to the book in April of 2010. "Tre" is a blend of Sangiovese, Merlot and Cabernet. The grapes are carefully selected from our three estates Brancaia (Castellina), Poppi (Radda) and Brancaia in Maremma (Morellino di Scansano). The wine ages 12 months in French tonneaux. Apparently, there is an allowable percentage of purchased fruit or bulk wine. On the other hand, perhaps the winery should not mislead customers saying the wine is made from fruit grown in their own vineyards? Brancaia TRE is a wine full of character giving you drinking pleasure already at the moment of release. TRE stands for the three grape varieties Sangiovese, Merlot and Cabernet Sauvignon and for our three Tuscan estates - the basis for this wine. Now the fruit from their estate vineyards is "the basis" for this wine. It's a clever way of leading consumers to believe the wine comes from Brancaia's own vineyards, while leaving it open for the explanation that they buy grapes or wine. 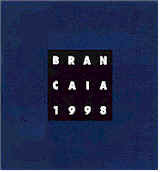 The Brancaia wines had been imported by the Hess folks for a number of years and in March of 2012 they announced a change. 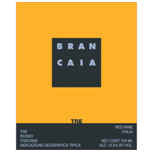 Can you imagine Gallo now importing the wines of Brancaia?!?! 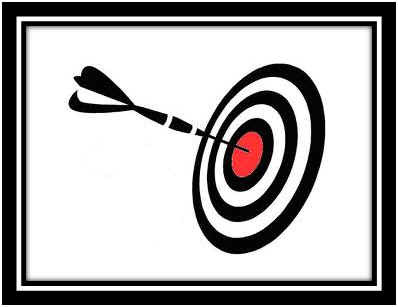 Gallo has put together a portfolio of producers which had a measure of prestige. Now they import Allegrini, Renato Ratti, Jermann, Argiano and Pieropan wines in their "Lux" portfolio. Brancaia is not in that same grouping, but is sold with Gallo's very modest Da Vinci brand of Tuscan reds and their La Marca Prosecco. Oh my! Currently in stock: We no longer stock these for, as you can imagine, a variety of reasons. In America, we think of some building or place as being "old" when it's 50 to 100 years of age. This abbey was built, we understand, back in 1089. Historical documents indicate the place was operated by monastic orders of various types...Benedictine monks, at one point and Camaldolites at another. I suppose the former drank a French liqueur and the latter smoked some sort of cigarettes made by R.J. Reynolds wrapped in the sleeves of their monastic robes. Today the property is owned by the Gaslini family and it's a short drive from the shadows of the tower in Pisa. We've had various wines from the property off-and-on over the years. The property encompasses something like 500 hectares, with 80 of them being devoted to vineyards. It's not a huge winery, but it's not a tiny cellar, either. We've been fans of their basic, simple Chianti wine. 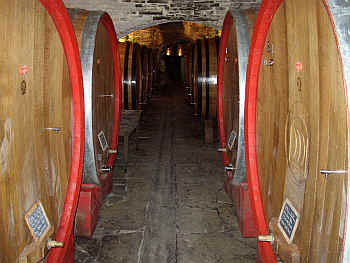 Since the vineyards are located in the Pisa region, it's outside the "Classico" zone and takes simple the name Chianti. This is good news, for the word "classico" adds a few bucks to the pricing of any Chianti wine, whether the quality justifies the premium or not. Savvy buyers know to explore off the "beaten path" and so wines such as this estate's can be good values. The 2015 vintage Chianti is one of our best buys. It's called "I Sodi del Paretaio" since calling this merely "Chianti" takes all the mystery out of life. The wine is about 85% Sangiovese with the balance being split between Cabernet, Merlot and now Syrah. Despite the presence of the Bordeaux varieties, the Sangiovese really sings in this wine. It's a cherryish, medium-bodied red wine. This is a totally dry wine and it's a far cry from internationally-styled, oaky reds which litter the enological landscape these days. When you taste this wine, you'll understand they were trying to appeal to someone seated in a restaurant with a savory pasta dish before them, not some wine critic locked in a tasting room who's evaluating a flight of 50 or a hundred wines. California does not make this sort of wine. First, ten bucks is not enough to cover the tour and tasting fee at many wineries. Secondly, the average consumer of California wines is not looking for a wine with 'snap' or tangy acidity; the sort of balance that acts as a palate cleanser when paired with food. Anyway, we're fans. You might be too if you've got a big bowl of steaming hot pasta with a slowly-simmered tomato sauce. The winery also makes some other offerings. We can order Badia di Morrona's other wines for you. They have a special bottling of Sangiovese called "VignAalta," as well as a mid-level Cabernet/Sangiovese/Merlot blend called Taneto. Vin Santo here is quite good, too. The estate also has a number of "agriturismo" apartments. It looks like a nice place to stay. The La Fiorita venture was founded in 1992 by three partners. One was winemaker Roberto Cipresso. Another was Lucio Gomiero who owns Vignalta in the Colli Euganei near Padova and the third fellow is race car driver Tiziano Siviero. But things have changed and now Roberto Cipresso remains at the helm and the other two have been bought out. The property consists of two, Poggio al Sole and a larger piece at Pian Bossolino and the vineyards are all mature, as the youngest vines are more than 15 years of age. Cipresso spends much of his time making wine for other brands and wineries.. He's a consultant for nearly two dozen producers today and he's worked with several dozen more in the past, helping them establish their winemaking regimens. He's even been affiliated with overseas wineries! He took over a nice facility in the Montalcino area, not far from Frescobaldi's Castelgiocondo. 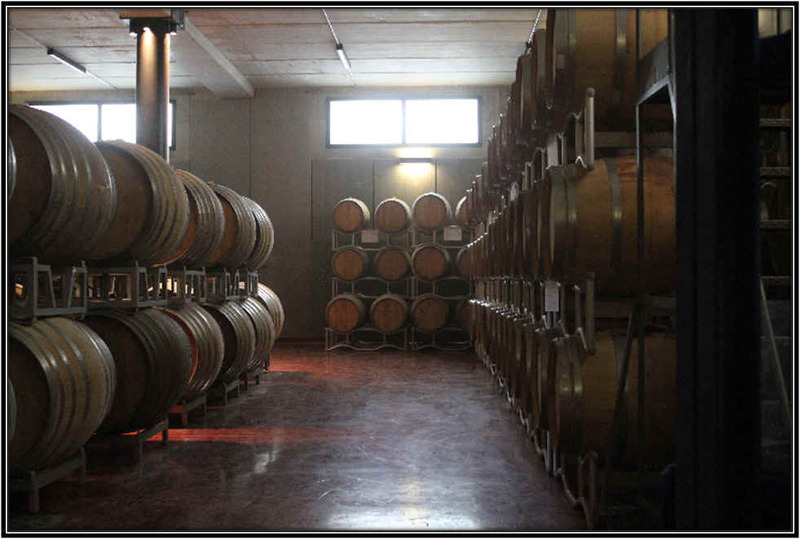 The place is owned by some Swiss investor and it houses perhaps a half a dozen of Cipresso's winemaking projects. Cipresso is also famed for collaborating with an American woman named Natalie Oliveros. Ms. Oliveros has a stage name, too, going by Savanna Samson and she's made more than a couple of dozen sexually explicit movies. We don't carry her "Sogno" wines, so if you're looking for those, you'll have to try the X-Rated Wine store down the block. 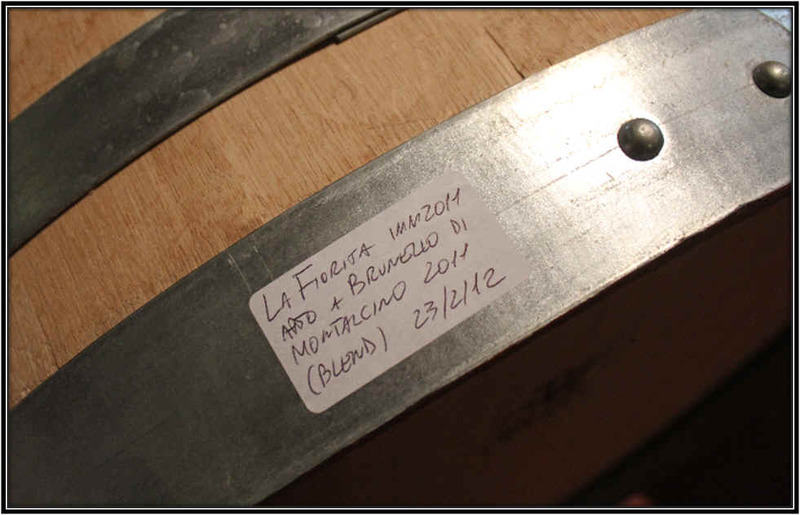 We did have Cipresso's wonderful 2006 vintage of Brunello di Montalcino, a wine which saw about a year in French oak puncheons before being racked into large cooperage. What makes this fellow's wine approachable in its youth is that he strives to produce wines with a softer profile of tannin. We understand he's a bit of a stickler in monitoring the ripening of the fruit in the vineyards so as to hit just the right moment before the grapes start to dehydrate and become over-ripe. On top of that, he keeps a watchful eye on the fermentation and the skin contact, looking for a moderate level of tannin, but not a hugely astringent or coarse wine. The 2006 Brunello hits what we imagine to be Cipresso's target right on the bull's-eye. The wine has a bright cherry note of Sangiovese along with a nicely woodsy bouquet and flavor. The oak is fairly prominent at this stage and we expect it will diminish somewhat with several more years of bottle aging. It's the sort of wine which pairs handsomely in its youth with grilled or roasted red meats. It has sufficient tannin to last another ten years, we expect, but it's wonderfully showy now. We have tasted a number of vintages and they're typically well-made. The 2006 was special, though, and we hope to find another that hits the mark. The Tenuta dell'Ornellaia was founded in 1981. It's undergone a series of changes in ownership and this week it's the property of the Frescobaldi clan. When it was founded, Ornellaia was the work of Ludovico Antinori, who's older brother Piero is somewhat famed for some Tuscan wines, including something called Chianti Classico. Piero also makes a wine called Solaia, his entry in the Bolgheri wine derby. Ludovico's cousin Nicol� Incisa della Rochetta owns the cellar next door, a property known as Tenuta San Guido which makes the famed red wine called Sassicaia. Robert Mondavi was a shareholder in the winery as of 1999 and became the sole proprietor a few years later. Mondavi also had a partnership with the Frescobaldi family to produce "Luce" in Montalcino. 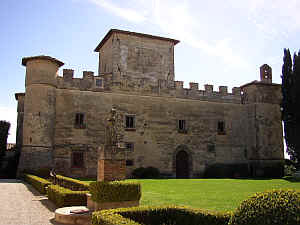 The Frescobaldis took control of Ornellaia in 2005. The early vintages of Ornellaia were perfectly pleasant wines with the typical tax assessment of royal wine families incorporated into the price. Ornellaia is their main red wine, though now they make a second wine called Le Serre Nuove. There's a remarkably fine and hugely expensive Merlot called Masseto and a Sangiovese blend called Le Volte. There was, once upon a time, a Sauvignon Blanc which has since been discontinued. Ornellaia, for our tastes, was a modest copy of Sassicaia at the outset. Since the 1980s, it seems to us that Ornellaia has pulled ahead in this horse race and having tasted the 2007s from both properties side-by-side, we much preferred the Ornellaia. We will admit to having a preference for Cabernet-based wines rather than those made of Merlot, so our choice of Ornellaia is curious since its percentage of Cabernet has been reduced to somewhere between 50%-60% of the blend. If you're able to afford such a luxury, do splurge and treat yourself (and perhaps a few friends if they're worthy) to a bottle of the 2012 Ornellaia. It's a totally charming bottle of wine, being beautifully balanced and drinkable at this early stage and yet with some potential for further development in the cellar. Our Milanese pal Carlo Perini has treated us to an older vintage of Ornellaia which had aged very handsomely. I was stunned, in fact, to find the wine had blossomed so magnificently. In May of 2010 we enjoyed a nice bottle of Masseto, another strikingly fine Tuscan red. This estate is located a bit off the beaten path, although a couple of neighboring wineries are quite famous and this one is reasonably well-known to Chianti Classico aficionados. The neighbors are Castello di Monsanto to the south and Isole e Olena to the north...Paneretta is situated on a very minor road and so it's not a property that gets as many casual tourists as easier-to-find Chianti wineries. The philosophy at Paneretta is one we appreciate: no Merlot and no Cabernet Sauvignon. They actually have the idea that while Cabernet and Merlot can be cultivated with success around the world, Sangiovese has its home in Tuscany's Chianti region. We had, some years ago, a wonderful 2000 vintage from Paneretta, a relatively modest vintage so they incorporated their top vineyards into their basic Chianti Classico, forgoing the fancy bottlings that year. The Paneretta wines have had a few different local importers and availability has been sketchy. We had the 2006 and it was quite good. In 2017 we tasted their wine alongside dozens of other Tuscans and this was perhaps the most showy Chianti Classico we had found. It's 90% Sangiovese with 10% Canaiolo. No Cabernet or Merlot. 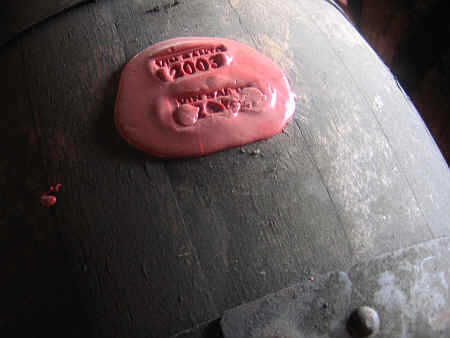 The wine spent about 2 years in wood, as they use cooperage of various sizes to mature this wine. We like the hints of wood spice lurking behind the red fruit notes. Paneretta has a nice cellar full of these traditional, large wooden tanks. We have asked Tuscan winemakers who blend their Sangiovese-based wines with Bordeaux grape varieties why we've not met any French winemakers who tell us about blending Sangiovese into their Cabernet/Merlot wines. The La Massa winery is a bit of a Bordeaux-centric estate in a prime spot in Tuscany. The winery was founded by Giampaolo Motta who hails from Napoli. His family was in the leather industry which didn't appeal to him. At some point he ventured to France and got a taste for Bordeaux after visiting numerous cellars there. Returning to Italy with a taste for wine, he found himself in Tuscany where he worked at the Riecine winery, an artisan estate in Gaiole in Chianti. He also spent time with the large Zonin winery's Castello di Albola before taking a job with the prestigious Castello di Rampolla. A property near Rampolla in a prime location was on the market and Motta was able to purchase that in 1991. This is located in Panzano's famed Conca d'Oro, a prime site in the Chianti Classico region. The first La Massa wines were made predominantly of Sangiovese and were made according to the regulations for Chianti Classico. But then in 2002 or 2003 Motta decided the rules for Chianti Classico were not allowing him to make the sorts of wines he was interested in making, having been bitten by the Bordeaux wine bug. So he then threw off those restrictive shackles and embraced the idea of labeling the wines as IGT (Indicazione Geografica Tipica), allowing for him to blend his Sangiovese with Cabernet, Merlot and Alicante Bouschet for his normal red wine. For his special bottling, Giorgio Primo, this is now Cabernet Sauvignon, Merlot and Petit Verdot. Motta, despite turning his back on labeling the wines as "Chianti Classico" so he can blend in other grapes as he likes, does make a pure Sangiovese. It's named after his daughter Carla. It's called Carla 6. No Cabernet or Merlot. Yet. And it doesn't carry the Chianti Classico designation.